Upon arrival our driver will be waiting for you and transfer you to Kampala. Upon arrival you will check in the hotel and there after depending with your schedule spend the remaining hours in Kampala as you await to be picked up the following morning. 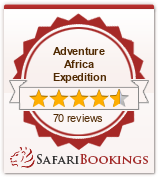 Please note that gorilla trekking is strenuous activity and someone should be fit to enjoy this safari. Minimum trekking age is fifteen years. Anyone with sign of communicable diseases will not be allowed to trek. (Flue, Diarrhoea)Being in possession of gorilla permit is a guarantee of trekking and sighting the gorillas, the quality of the gorilla trekking cannot be guaranteed, minimum time allowed with the gorilla will not exceed 1 hour. That’s you are allowed only 1 hour with the gorilla. 6: Drinking water throughout the tripe. Please note that clients will be traveling in 4wheel drive vehicles, with enough legroom, with well-experienced guides who can handle all the requirements of the discerning travelers.